Here we are with our September Newsletter! 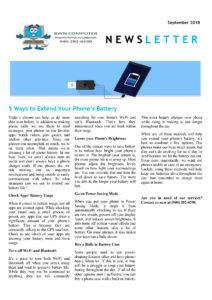 First…we look at some of the things you can do to extend the battery life of your phone. Of course, batteries do hold less and less of a charge over time as they get older, so, purchasing and installing a new battery…may be your best resolution for older phones/batteries. 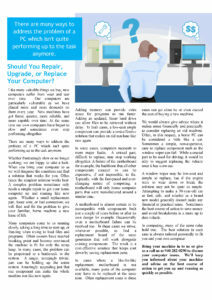 The second page goes over some of the things to look at when deciding on if you should repair, upgrade or replace your computer. Of course…we are always here to help you in making the best decision when it comes to your computers.